Maybe the title of this post overstates it a bit. Usually, I get to see more Rachael Ray recommended spots when I visit somewhere (like my recent trip to Seattle), but this trip to Los Angeles had a tight itinerary of fun stuff to do, so we only made it to one: Neptune's Net. 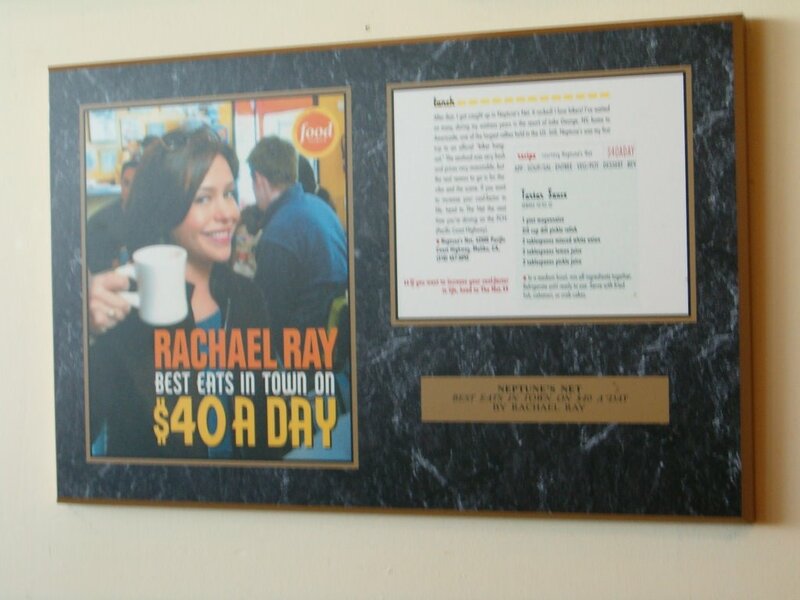 This oceanside seafood restaurant was featured in $40 a day (and proudly displays the plaque pictured at left). It was a tough decision between Neptune's Net and the Paradise Cove Beach Cafe, which was featured on Tasty Travels. In the absence of any other way to decide, we went for the cheaper place. Because I hadn't seen the episode of $40 a day, I didn't realize that in addition to being a surfer hangout, Neptune's Net is also a biker hangout. But, after getting over the initial intimidation factor of walking past all the bikers in my sparkley pink tank top, I was glad we picked this spot. You have two options, the restaurant side and the seafood side. Both serve seafood, so don't let the names fool you! The difference is that the seafood is deep fried on the restaurant side and steamed on the seafood side. When you go in, the first thing you do is grab your drinks out of a cooler (they have beer too!) and any other snacks that you want. Then you get in line to order. We got two combos: the crab cakes and the scallops. Have you ever seen deep fried scallops on a menu? Me either. And it was a pleasant surprise. They are outstanding! And the crab cakes were some of the best I have ever had. You could see the chunks of crab and bell peppers and they were nice and crispy on the outside and soft on the inside. The fries that come with the combos were extremely average, but not bad. The best thing about Neptune's Net, other than the food, is the cool beach hangout atmosphere. The floor is dirty and the windows have a layer of dirt on them, but you can see a Malibu beach just on the other side of the Pacific Coast Highway. And how often do I get to walk through a crowd of bikers? It definitely was! And did I mention the crab cakes were soooo good? Cuz they were! We need to coordinate better. And speaking of 6 degrees of separation, Chris' Aunt and Uncle are camera operators (they did work on Weddings of a Lifetime and Extreme Makeover). They recently interviewed Kevin Bacon. So I am the third degree with him now. That makes you 4!